A known weak point on all 3 series and 3-series based vehicles is the rear upper shock mount and the mounting location. Performance dampers exacerbate this problem, and it can be ugly! For whatever reason, this shock mount area is something BMW never got right on the three series from the 1983 until the 2007 modes: the OEM mounts are sloppy and fatigue quickly and the sheet metal area around them can be deformed over time simply by absorbing road irregularities. The stress high performance shocks can apply to the chassis has been know to cause permanent damage (even under daily driving conditions) without antiquate reinforcement! Many companies make an upper shock mount, but we use and sell what we believe are the best performing solid-mount RSM you will find. Structural improvement and quality in these sets is dramatically better next to other "high performance" shock mounts. Many other mounts (even many performance mounts) are too compliant to allow the shock to receive the feedback from the road surface for top performance from the shock. They may actually hinder the shocks ability to do its job. The common misconception is that without compliance in this area, the shock cannot do its job; this is not the case. Passing the most accurate amount of road feedback into the damper allows lighting fast responses inside of the shock to occur. In fact, with high quality shocks, you could uses these mounts on the street- however you would hear a lot more noise as the shocks valves operate and tire noise is transferred into the cabin a bit better. Solid mount means the damper receive all crucial suspension movement so your high performance suspension can do its job and maintain tire contact patch. All important chassis feedback is improved as the driver can feel what the rear tires are doing better than ever. 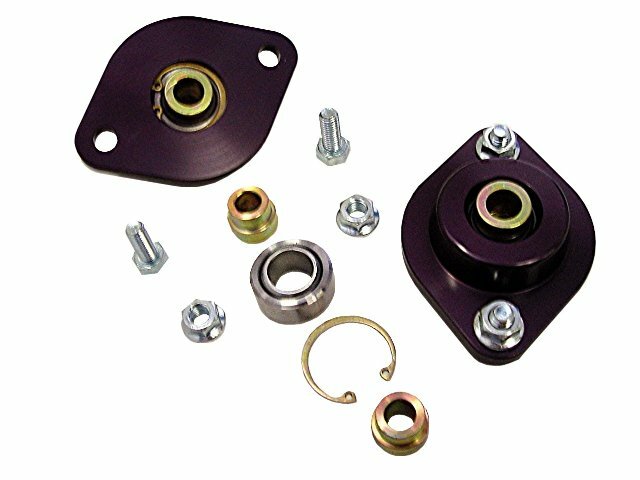 They also include shock tower reinforcement plates, a necessity and typically sold separately for $30- for free in each set. The best we have found for track level performance: Supremely responsive for the track, high quality bearing for years of use. A must have when doing rear shock upgrades for track use, these will save you time, money, and help save your chassis. -Fits all of the following: All E30, E36, E46, Z3, Z4, M coupe & Roadster. -Please specify the diameter of your rear shocks piston rod when ordering. Many double adjustable shocks require a 12mm RSM, while most direct replacement shocks are 10mm.